Everything You Need to Know About Power Surge Protection | Hi-Lite Electric Inc.
A power surge occurs when the voltage that flows through varying electrical units suddenly increases. The spike in power pushes the conduits past their standard voltage levels, most of which max out at 120 volts. Can a Power Surge Cause Damage? Different electrical appliances and devices are designed with a specific voltage that they can handle. But when these appliances are exposed to a higher voltage than that for which they were designed, it’s common for them to become damaged. As a general rule, larger voltages will result in higher amounts of damage. Similarly, repeated surges are more likely to result in more damage than a one-and-done surge. When a voltage surge is sudden and severe, such as those experienced in the midst of a lightning strike, it can cause electronic devices to fail immediately and totally. In these cases, repair work is necessary at best, and replacements are needed at worst. However, even small surges can cause damage when they occur repeatedly over a long period of time. The most common damage incurred during a surge is an appliances wiring being rapidly heated up, and then rapidly cooled. If this overheating process repeats several times over any length of time, this can lead to electronic rusting and, eventually, total failure of the appliance in question. Damages to home appliances are well documented and probably the best known to the public. But there are also massive effects in industrial work, especially when expensive machinery is affected. Sometimes, entire portions of a power grid can be affected by an untimely surge or series of surges. It’s common for minor surges to be undetected by the homeowners. Most homeowners notice when an appliance spontaneously stops working, but when the appliance doesn’t fail, they can often fail to notice the signs themselves. Experts call surges “silent killers” of appliances for this very reason; it’s easy to have an appliance or electronic device being consistently damaged without your knowledge. Is There a Difference Between a Power Surge and a Power Spike? There is a difference between power surges and power spikes, although it may not be what you expect. The difference is marked by longevity. When voltage suddenly rises, and the increased voltage lasts for at least three or more nanoseconds, it’s considered a voltage surge. Spikes, meanwhile, are shorter power increases. Both surges and spikes can cause damage to and disrupt working systems, but surges are more damaging due to their increased longevity. Longer periods of time allow the circuitry to heat further than a mere spike would. Experts say that there are two main causes of a voltage surge: internal sources and external causes. Internal sources are due to changes in the appliance or the internal system of circuitry. External causes exist outside of whatever system was just affected. Many electronic devices operate through the use of an on/off power button. Alternatively, they’re operated through the increase and decrease of the power flow through the circuitry. Dimmer switches and thermostats are both examples of a circuit which is created to increase or decrease an overall electrical load. Meanwhile, compressors and fans are examples of devices which are controlled through power. When they’re repeatedly turned on and off, the available power in the home is affected. Running too many appliances isn’t the only cause of internally based voltage surges. Another source can be referred to as “magnetic coupling.” This involves the flow of electricity through a circuit. During this process, a magnetic field occurs. Sometimes, this magnetic field is able to affect the circuitry and wiring near it, which induces an unexpected voltage in them. This leads to a surge. The final internal source is static electricity, which can build up in any appliance system over a period of time. When the electricity is finally discharged, it increases the voltage of the appliance and causes a brief voltage surge. External causes largely depend on the region in which a person lives. Oftentimes, citizens of developing countries will observe power surges when there are differences in the way power is being used across the national grid. Sometimes people turn on their televisions and air conditioning as they arrive home. When all of these power drains are turned off at once, the risk of power surges increases. In other regions of the world, the most common external cause of power surges tends to be lightning. Sometimes lightning will strike the actual circuit, which causes a power surge. More commonly, however, lightning will hit circuits nearby the circuit which experiences the surge. One example is a power cable overhead being hit by a lightning strike, and voltage levels in the houses surrounding the cable subsequently having their electrical output increased. The most simple solution to the risk of power surges is to plug electronics and appliances into a patented surge protector. Surge protectors are designed to protect a person’s appliances and electronics from the damage incurred during a power surge. Many people also use surge protectors to provide multiple electrical outlets where previously there was only one. Surge protectors, sometimes known as power strips, are rows of electrical outlets that plug into a single outlet through the use of an extension cord. This strip then pulls electrical currents from the outlet via the extension cord, and then it passes those currents throughout its own power outlets, diluting the electricity. More importantly, surge protectors have a metal oxide varistor feature. This feature diverts any extra voltage to prevent it from causing damage to your appliances. The MOV will act differently depending on the current flow of voltage. If the MOV recognizes that voltage levels are high, it will reduce its resistance to power currents. When voltage levels are low, the MOV will allow a higher resistance quota. That said, MOVs are capable of burning out. 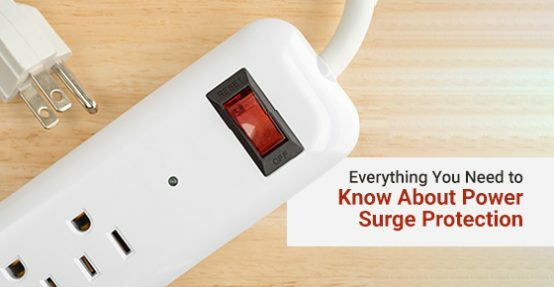 You should use a surge protector that has an indicator light so you know when it’s working. Hi-Lite Electric Inc. is a Canadian company with years of expertise in the electrical field. To learn more about surge protection, visit our website.